The Panasonic ES-LT41-K Arc 3 is one of those electric shavers that don’t include all the gimmicks of the very expensive ones but still perform great and they do so without the premium price tag. Part of the older Arc 3 generation, the ES-LT41-K is still a relevant shaver today, particularly when we consider the latest Arc 3 models that don’t really offer any compelling features apart from a slicker design. Read along for our in-depth Panasonic ES-LT41-K review as we take a close look at the pros and cons of this razor and also check out some options that may be better in several situations. 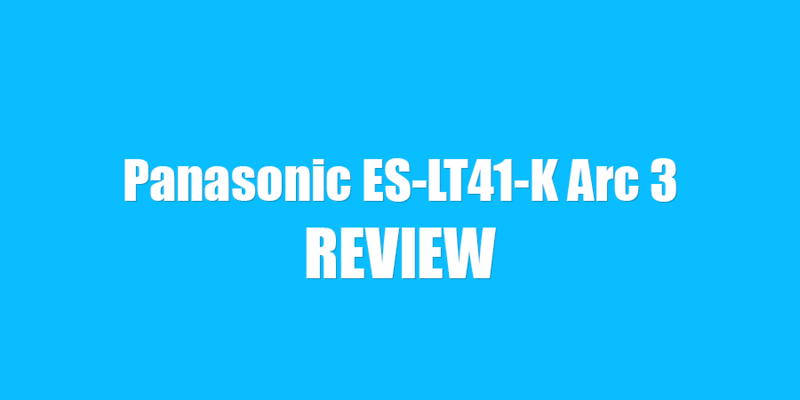 Wrapup — Who should buy the ES-LT41-K? The ES-LT4-K comes packed with the usual features of Panasonic shavers in this price range, along with a couple of very interesting ones. Let’s take a quick look at the most important ones and see what they really mean. 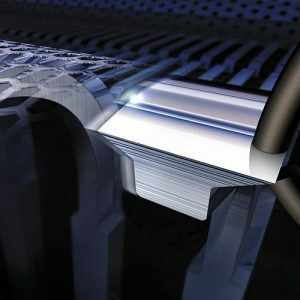 30-Degree Stainless Nanotech Blades — I’ve said it on multiple occasions, but Panasonic really makes some of the best blades out there. Period. Beyond the marketing and gimmicky sounding name, these are high-quality, extremely sharp, durable Japan made stainless steel blades. They are also angled at 30 degrees, further reducing the pulling and tugging sensation that can be experienced with other shavers. Fast Linear Motor Drive — a 13 000 CPM (cycles per minute) motor powers the cutting block of the ES-LT41K. That is definitely fast and only slightly lower than the 14000 units from the much more expensive Panasonic shavers. A powerful motor is extremely important for the quality of the shave. To be more precise, the shaving time and comfort are greatly improved. Multi-Fit Arc Blades — The word ARC in all of Panasonic’s products means that the blades and the outer foil feature a slightly curved profile; they are also able to move independently. 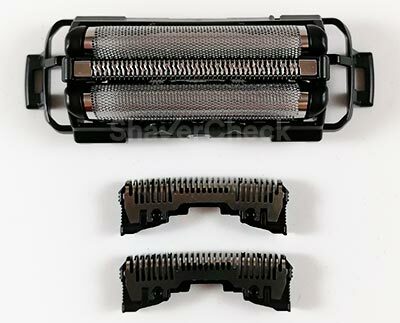 This shaver in particular features 3 blades (hence the Arc 3 name), the middle one being a slit foil designed to catch and cut very long hairs to a suitable length for the other two blades to tackle. Flexible pivoting head — the shaving head can tilt left and right; it doesn’t have the back and forth pivoting function of the more expensive shavers (like the ES-LA93-K). The head can also be locked in place by a switch located on the side of the shaver. 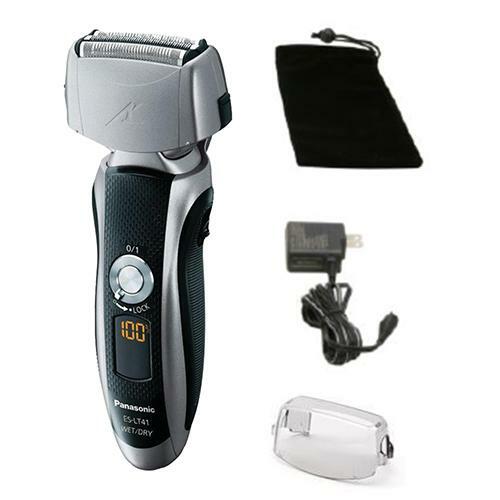 With a black and silver color scheme, this electric shaver has a premium look and feel to it. It’s definitely a step up from the older Arc 3 design and actually feels more expensive than it really is. Lightweight and comfortable to hold, it features rubber inserts on the sides that provide an excellent grip. The build quality is also very good and feels sturdy and durable. Being on the smaller side, especially when compared to the more hefty shavers that feature 4 blades (ARC 4), the ES-LT41K is very nimble and easy to use. You will appreciate its ergonomics when shaving tricky spots like the upper lip area and your chin. Another plus in the ergonomics department is the presence of a physical travel lock. It’s a simple ring surrounding the ON/OFF button that can be easily moved from the unlocked to the locked position. Again, older Arc 3 models like the ES8103S don’t feature a travel lock. The ES-LT41K can only be operated cordless; as it’s the case with all the dry/wet electric shavers, the manufacturer has disabled the use of the device when plugged in for safety concerns. The Li-ion battery can be fully charged in approximately 60 minutes and it will provide power for 50 minutes of use. 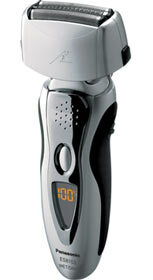 The 5 minute quick charge feature allows the shaver to be used for one shave when the battery is completely depleted. Overall, solid battery performance but nothing outstanding. The battery percentage indicator shows the remaining power in increments of 10%, a lot more useful than the basic 2 bar indicators on other entry-level shavers. The device is also fitted with an Automatic Dual Voltage Converter (AC 100 – 240V), allowing you to charge it anywhere in the world. Being completely waterproof, cleaning the device is as easy as it gets. After every use, just apply some liquid hand soap and water on the outer foil and turn it on for around 20 seconds. Pressing and holding the power button for more than 2 seconds will activate what Panasonic calls Sonic Vibrations Cleaning Mode. Basically, the inner blades will vibrate vigorously for more efficient cleaning and will automatically turn off once the cycle is completed. After that, just remove the outer foil and rinse the shaver under running tap water. When rinsing the cutting block it is recommended to activate the cleaning mode again for a more thorough cleaning. Pat dry with a cloth and you’re all set. You should also lubricate the blades on a regular basis since soap will also remove any traces of lubricant and can accelerate the wear of the blades and foil. It’s safe to say that the shaving performance of this razor will satisfy most men; coarse stubble and difficult areas like the neck will require additional passes, but with a little patience and the right technique you can get very close and reasonably comfortable shaves. As all entry-level foil shavers, it will work best on shorter facial hair, so using the ES-LT41-K daily or every other day will get you the best results. Using this shaver with an electric pre-shave lotion or with a quality shaving cream can further improve your shaving experience. Panasonic shavers can feel a bit too aggressive if you have sensitive skin and this one is no exception. Fewer blades and the smaller surface of the outer foil that comes in contact with the skin means that shaving will take a bit longer when compared to the ES-LA63-S for example. On the upside, the razor is very nimble and easy to maneuver, especially when shaving around your sideburns, upper lip area or goatee, making it a great choice for a beginner as well. As for the downsides, using this razor on a long beard (more than 3 days of growth) will not be ideal since it tends to miss a few hairs, especially that lie flat on the skin. 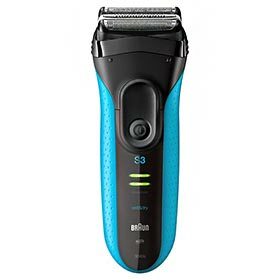 That’s why it’s best to use it more often or if that’s not an option you should consider a more advanced shaver that deals better with flat hairs like the Braun Series 5. The popup trimmer on the ES-LT41-K is pretty much the same type from all of Panasonic’s shavers, meaning that its positioning is a bit unpractical. You’ll have no problem using it for general grooming, but for actions that require more finesse, it’s not that great. One thing that helps is to have the outer foil and inner blades removed before using the trimmer so you’ll be able to see what you’re doing. On the other hand, the trimmer is very effective at cutting the hairs with few strokes and doesn’t pinch the skin. 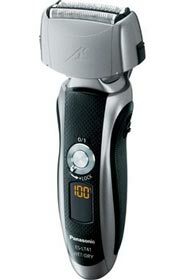 Considering the price and overall performance, the Panasonic ES-LT41K is a very solid shaver. The outer foil and inner blades can be bought separately or bundled together. Panasonic recommends replacing them after one year, but that greatly depends on the frequency of use and how coarse is your facial hair. You’re usually better off buying the combo and replacing both the inner blades and the foils. Panasonic shavers usually impress with their great performance in the low-end category of products. This one is no exception and it’s one of the better electric razors out there. Unless you’re extremely picky, almost anyone looking for a quality, budget-friendly foil shaver will be more than happy with it. The ES-LT41-K can provide an impressively close shave as long as your beard isn’t excessively long and your skin is not overly sensitive. Even though it works great for dry shaving, using the ES-LT41-K with a quality shaving cream can make a big difference in the closeness and particularly the comfort of the shave. If you’re someone that enjoys even occasional wet shaving, this shaver is for you. Also, if you’re just getting started with electric shaving, you can’t really go wrong with this one, being extremely user-friendly and easy to use and clean. Being compact and featuring a universal voltage regulator, it is also great for traveling and quick shaves before meetings. The first natural alternative to the ES-LT41-K is of course the older ES8103S. Performance-wise, they’re pretty much identical. They use the same blades and both are fitted with the same motor. The ES8103S however doesn’t have a travel lock and it’s beginning to look a bit dated. However, since the actual shaving performance is virtually identical, it should be a great alternative if you can get it for less money. The Series 3 from Braun is the direct competitor to the Arc 3 range in the entry-level segment. Both are excellent options for budget-oriented buyers, but they do excel at different things. While the Arc 3 shaves closer, the Series 3 is more comfortable and also more efficient at catching longer hairs. So if you have sensitive skin and are willing to tradeoff just a bit of that closeness for a more comfortable shave, the Series 3 is probably a better pick. Moreover, it’s generally cheaper and the replacement parts are cheaper as well. The 3040s is probably the pick of the range as it’s a great compromise of features and costs. Thank you for such a great website. Your reviews are very helpful. I have been a foil shaver user for years. I am currently using an agin Braun 7000 I believe, which looks most similar to a Series 7 now. I am on my second trimmer for it, the battery doesn’t hold much of a charge, and I just blew threw the foil. I am considering just getting a whole new shaver, but I am MUCH more price conscious than I used to be. The ES-LT33-S does indeed look very similar to the ES-LT41-K and performance-wise they should be identical (same motor, same foils and inner blades). My decision would however be based on my personal needs and a given budget, so my choice wouldn’t be entirely relevant. For example, you didn’t mention anything about your facial hair (light, medium thick), how often you usually shave or if you have sensitive skin. The ES-LV65-S is in my opinion the high-end shaver that offers the best bang for the buck; at that price you won’t find an electric razor that shaves as close or as fast. It can be overkill if you a light beard and it also has a massive 5 blade head, so if you decide to buy it you’ll need some time to get used to it. A Series 7 is noticeably slimmer and more maneuverable. The ES8243A looks like a great compromise; it has excellent performance and it’s a bit more user-friendly compared to the larger Arc 5. The replacement foils & blades combos are also cheaper. The two Arc 3 models are great performers in their price category, but since they have 3 shaving elements they won’t be quite as fast as the other two options. The Arc 3 shavers are very easy to use, they cost less and the replacement parts are also cheaper. For shaving daily they are easily good enough. As you can see, all of them have their pros and cons and it’s up to you to decide which one would be a better fit. One thing to keep in mind is that Panasonics tend to be a little aggressive in comparison to Braun shavers. They shave closer, but if you press too hard they will let you know.